The photograph was taken in Petikko on January 14th. Temperature dropped to -18 °C during the night. 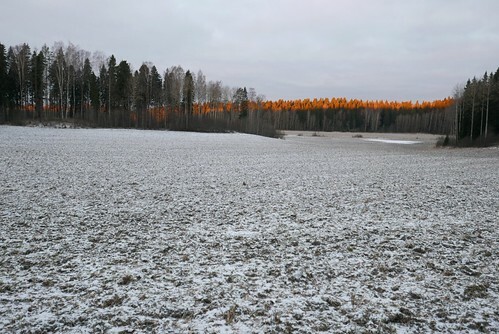 I'm planning to go for a walk in Nuuksio today, to enjoy the bright snow fields. I like the composition and the red line on the top of the trees. In January the sun never rises high above the horizon, and this was taken early in the morning when the light was reddish.